finance minister Pranab Mukherjee's 2009-10 budget has tried to invigorate rural consumption. Spending on the National Rural Employment Guarantee Scheme (nregs), an election winner for the Congress, has increased maximum (see box). Now 44.7 million rural families will benefit as against 33.9 million last year. 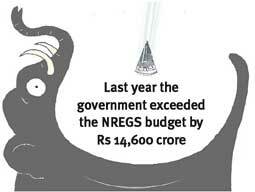 Mukherjee said other schemes involving agriculture, forests and water resources would converge with nregs. But doubts persist. "The convergence will work if the assets created are good and last long. The government is not measuring the outcome," said N C Saxena, Supreme Court appointed food commissioner. "Last year the government exceeded the nregs budget and spent about Rs 36,000.So the actual increase in allocation is about Rs 3,000 crore only which is not enough to cover the extra families" said cpi(m) parliamentarian Basudev Acharya. Environment finds only a passing mention in the budget. The allocation for environment and forests is Rs 2,129 crore, just 0.2 per cent of the total budget expenditure. Only spending on lake and river conservation has increased (59 per cent) which water activists say is not enough. "There is no strategy to revive lakes and rivers," said Manoj Mishra, of non-profit Yamuna Jiye Abhiyan. The budget has given oil and gas companies a big push. It has proposed a national grid for liquefied gas, on the lines of a power grid, to transport natural gas from the Krishna-Godavari basin. This would help power and transport sectors. Mineral companies, exploring oil and gas, have been given a seven-year tax holiday. This would make producing renewable energy, a key strategy to cut green house gases, more expensive. The minimum alternative tax (mat), tax paid by profit-making companies enjoying tax holiday, has been increased from 10 per cent to 15 per cent. "The planning for power plants using renewable energy like wind were undertaken keeping in mind 10 per cent mat. The viability of such projects would be affected now," said Jami Hossain, director of a wind power consultancy firm. The tax rebate of Rs 5,000 for large cars with 2,000 cc engines and above too has been criticized. "The finance minister should have reduced excise duty to zero on buses instead of cutting duty on large cars. This would have given a fillip to public transportation," said Anumita Roychowdhury of Delhi non-profit Centre for Science and Environment. To increase agricultural growth to four per cent, Mukherjee has increased farm credit and introduced subsidy on soil nutrients (instead of fertilizers). Former planning commission member A Vaidyanathan said the initiative is good, "but how will they ensure nutrient subsidy reaches farmers?" P K Joshi of the National Centre for Agricultural Economics and Policy research felt increasing agriculture credit is fine, but the government must pay attention to long-term strategies for rainfed agriculture and water conservation. The budget allocations for health and poverty alleviation were also deemed inadequate. "The increase in budget for rural health should be at least Rs 55,000 crore," said Dr Vinay Aggarwal of Indian Medical Association College of General Practitioners. The much publicized food subsidy scheme also falls flat the existing Antyodaya Anna Yojana provides 35 kg cheap rice and wheat to 2 crore poor families. The budget gives just 25 kg to below poverty line (bpl) families. "This has straight away reduced entitlement by 10 kg," said Biraj Patnaik, principal food commissioner appointed by Supreme Court. He also pointed out the government is yet to accept recommendations of the committee under rural development ministry that said 50 per cent of rural India is bpl.